Soba noodles. Another favorite of mine. I love them hot and I especially love them cold with a nice ponzu sauce. I created this “salad” the other day by taking pantry and fridge inventory to see what ingredients I needed to use up. This is always my favorite way to cook because it makes me feel resourceful. I used some fresh baby broccoli I had just bought combining it with some thinly sliced onions and fried garlic chips which are so easy to make and add a delicious crunch. In a small bowl, whisk together dressing ingredients and set aside. Heat a medium cast iron skillet over medium heat until it is very hot. * If you don’t have a cast iron you can use a regular frying pan that is NOT nonstick. Pat chicken dry and add to very hot pan skin side down. Immediately reduce heat to medium low. Cook without turning till skin is well browned and the skin releases easily, 7 to 8 minutes. There will be some oil splatter so be careful. Turn over, reduce heat to low and cook through for another 7 to 8 minutes. Meanwhile, Bring soy sauce, mirin, and brandy to a boil in a small saucepan for one minute. Let cool. Put cooked chicken in a resealable plastic bag or container, pour in sauce mixture and let chill for 15 minutes to an hour. Preheat boiler for chicken and bring a large pot of water to boil for soba. While that is warming, heat a few tablespoons of sesame oil in a medium skillet. Add your garlic slices and fry in oil till brown and crispy. Remove and put aside. Now add the onions, a pinch of salt, and another tbsp. sesame oil and cook for 3 min stirring frequently. Add the broccoli and sauté another 5 to 8 minutes until cooked through. Add the garlic chips and remove from heat. Follow instruction on soba packet and cook in boiling water. While that is cooking, place chicken back in your cast iron skillet (remove excess oil first) or an oven friendly dish, and broil for 4 to 5 minutes until skin begins to crisp. Remove from oven, let rest for 5 minutes and slice crosswise. 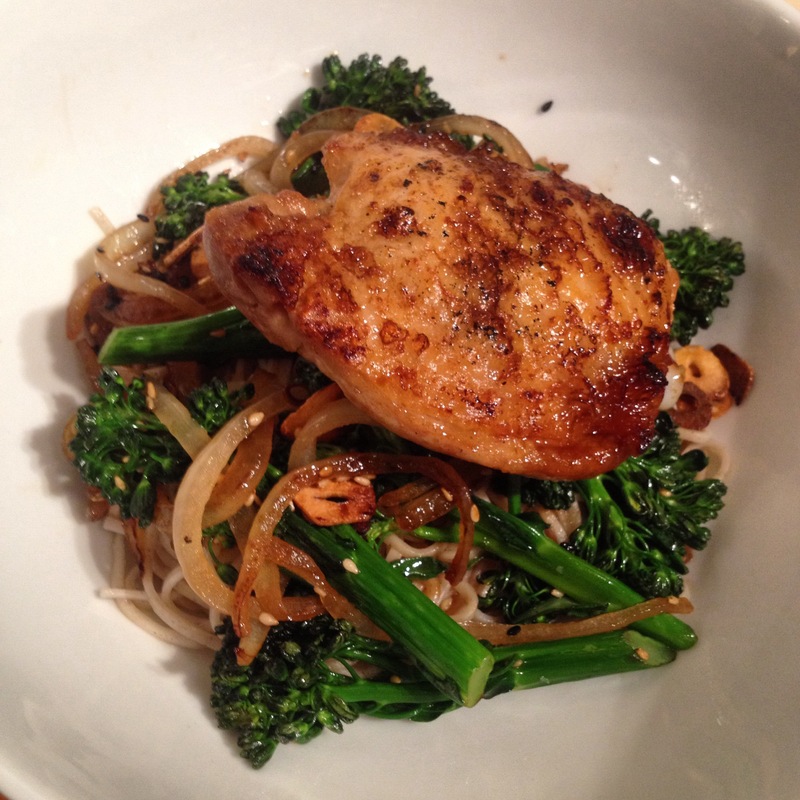 To serve, divide cooked noodles into 2 bowls, top with broccoli stir fry, sliced chicken and add dressing over top. Sprinkle with sesame seeds and enjoy! *Side note: If you don’t have a cast iron skillet I recommend you go out immediately and buy one. I got mine at Home Goods for $12. They should not be expensive and are amazing! Make sure when you buy a new one you “season” it properly. Look this up if you don’t know what I am talking about.